However, the core information is very relevant and well-presented. While it is true that you can find lots of college-level electrical engineering material online now for free, those courses are often stuffed full of theory and math. NEETS is aimed at a technician, so it is quite practical and includes sections on things as basic as reading schematics and as sophisticated as RF filters, microwave circuits, and fiber optics. Not that the course pulls too many punches. The section on oscillators, for example, covers in great detail how different oscillator types work (like the Pierce oscillator from module 9, below). It also covers frequency multipliers. The emphasis isn’t on their design, but understanding the principles of operation is a big step towards being able to design these circuits. There’s also a lot of background information on how a lot of components like ICs are built. Most of the modules have assignments and you can find the answers, too. You may need a little algebra, but not much and certainly nothing beyond that. The Navy has a lot of other training that might be interesting. There’s machine shop training, photography courses, and hydraulics. If you are looking for something more academic, the MITx Circuits and Electronics class is excellent and a great example of what can be done with Internet delivery of training. It’s truly a great time to be teaching yourself more about electronics! Considering the pace of technology in some organizations, dated wouldn’t be a negative. Nothing like downloading a teacher to make the experience complete. Not only that, dated is a relative term. The Navy was still using systems with Bubble Memory late into the ’90s. One application was gas turbine control consoles, which loaded their operating system from cassette tape to bubble memory. It takes a lot of money, time and effort to upgrade systems on a ship, and if the old one is working fine, it often doesn’t make sense to change them. They continue to operate until the ship has a major retrofit or is decommissioned. We were still using teletypes into the ’90s. TADIX and OTCIXS were still running over 9600 baud satellite circuits in the 2000’s. Some telephone exchanges were using core memory into the 2000’s, possibly not even the “old” ones, have a feeling it was the Ericsson System Y. Bit disappointed I didn’t manage to take a board of core memory with me, it’d be a cool relic. DUH, it was AXE-10, AKA System Y because System X was the older (but better) Marconi stuff. Those ended up with four pentiums strapped across a Z80 as an upgrade. Doing navy Electronics Tech school (in the 90s) basically came straight from these books. There is one called the Technicians Handbook that is a nice resource. I joined the Navy in 1985, went through BEE (Basic Electricity and Electronics) in Orlando and Electronic Technicians Class ‘A’ school in Great Lakes using these books. My Class ‘C’ school was IFF, a system to Identify Friend or Foe aircraft, which at that time consisted of circuit boards built with individual logic gate ICs. I spent hours looking at logic gate schematics, while the instructor traced highs and lows through the system to build out the functionality of the system. I retired in 2005 as an Electronic Technician Chief Petty Officer. I still have some of these in dead tree format in storage somewhere. There’s also a four book Mathematics series that is quite useful as well. Thank you all for your service. I was never in, but I’ve worked on many large military projects over the years, including Future Combat Systems (may it rest in peace). I work for a multinational scientific imaging instrument company and practically all of our service engineers come from the US Navy here in N America. Most of them, ex Electronic Technician PO or CPOs. Knowing the level of training the Navy provides, it is no surprise that these guys learn how to diagnose, repair and maintain high end scientific equipment in no time. I served at the Greek Navy in the late 90’s and I remember these books very well! Great material, very well written. I was a Radar Electronics Technician CPO, so of course found them very useful. The head of maintenance at the plant I use to work at was a veteran submariner, he recommended these to me when he found out I was learning about electronics as a hobby. He had to cover all of this material in 4 weeks for his deployment. He told me his brain literally hurt from having to cram all of the information in. When I went to ATT, I tried everything to stay up so I can get all this down in the allotted time. Eventually, I started putting frosting in my coffee to double my sugar as a creamer so I don’t waste time. I took the “Circuits and Electronics” course when it was first published online, and I can say that it does not have a very high level of presentation excellence. There’s a lot of droning on, theory without application; it’s basically just videotapes of lectures. I further mentioned these issues to the president of edX (face-to-face, in Cambridge) several times about the lack of quality and presentation variety and quality, and he said that their hands are tied because that’s the way the prof wanted to do it, and that’s the way it’s always been done in classrooms in the past. They have no plans for back-editing the lectures or re-recording segments to correct mistakes, to make sections more clear, or in any way dealing with feedback from the students. For contrast, Salman Khan has been varying the presentation methods, doing A/B testing, and finding out what really works for online presentation and learning. He’s reversed the typical classroom structure of lecture in class, homework at home to be “read the textbook at home, do homework in class” and found that it works much better. Kahn academy is the place to go if you want to learn anything that’s standard fare in high-school or college. With rare exception, online courses by colleges are pants at actually teaching things. Well I will confess I don’t watch the lectures much, but I found Agrawal’s (isn’t that his name?) written materials, online labs, etc. were great. I liked it a lot. Now, coming to it with an MSEE and just looking at the training might be a different perspective from actually trying to learn from it, but I thought it was well done. I’d be curious what others think to see which of us is not in the center of the bell curve. If you want an excellent counter-example for comparison, try Donald Sadoway’s “Introduction to Solid State Chemistry”. Skip the 1st lecture since it only talks about the syllabus and course administrivia (such as his office hours). This is an example of a very well presented course, it’s easy to watch and learn from, and it’s not your core expertise so you can approach it as a beginner. Once you’ve experienced a well presented course, go back and rewatch Dr. Agarwal’s presentations and see what you think, or check out Daphne Kohller’s online course “Probabalistic Graphic Models”. She takes a fairly simple and easy to understand field and makes it into a dense weeder of undergrads. As the saying goes it’s not enough to be right, you also have to be effective. Lots and lots of colleges and universities are putting courses online – but if no one can learn from them, what good are they? The title could have a double meaning. In some places, NEET refers to a person who is “Not in Employment, Education, or Training”. I don’t like the U.S navy schematic drawing conventions. What is not to like? Clear drawings, standard symbols, and concise prose. Well done for those in imperial service to the Emperor. You have probably been reading too many SF/adafruit/hackady entries that suffer from content dilution.and that obscene fritzing crap. You used these conventions when you designed tube radios, right? It’s very well done, meant to be draw both by hand and by machine, and extremely clear. Extremely similar to what I learned. So lets get past the personal bites, what is it that you dislike about the USN drawings? Or is it that you simply have no particular likes about it? Do you have a convention which you recommend instead? I’m always looking for new ways to make drawings faster to make or read and be clearer at the same time. 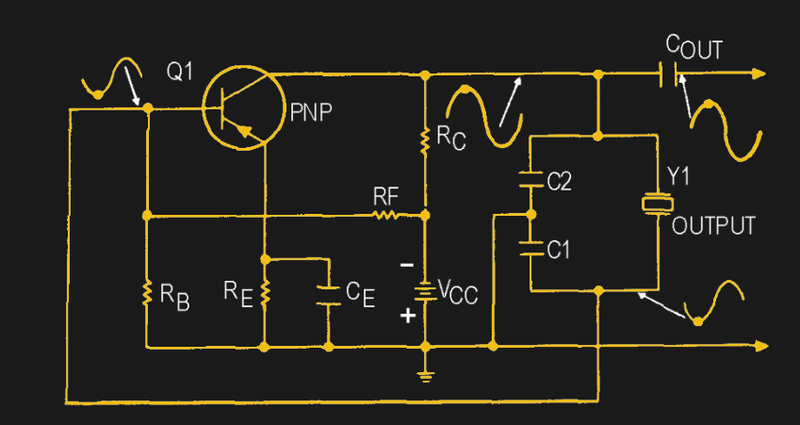 Common emitter stages should not be drawn with collector resistor to positive supply pointing down. I agree, it is a dated style. All the resistors pointing down, even those from Vcc. The strange way of drawing a Colpitts crystal oscillator. It obfuscates the operation of the circuit. It isn’t the worst way out there. Make Magazine is shameful in their use of a mixed schematic/pictorial with things like a quad NAND gate represented by merely a pictorial of the IC with no interior schematic symbols. Nice. Many of the techs I’ve worked with got their introduction and experience in electronics from the armed forces. One of the books I have is an electronics textbook used by the Canadian Navy. Dated 1946, but tubes are still pretty relevant in RF power applications, besides being retro-cool. archive.org also has Army manuals about things like welding, forging, simple wood and metal repairs, grinding, hand tool maintenance (sharpening drills, maintaining files, etc), milling, etc. They’re from World War 2, so the welding manual doesn’t cover any modern processes, but it does cover stick. And the milling manual is mostly about using horizontal mills. But there’s still useful information about workholding, indexing, speeds and feeds, gear cutting, etc. And the lathe coverage should be relevant today. I took the 13 month navy electronics course when I was in the Marine Corps back in 1993. I still have my NEETS module books and all the notes I took. It was one of the most comprehensive electronics courses I’ve seen and still very relevant, especially for HAMS. Highly recommended. I used a military technical reference manual on transistors to answer a very obscure question my physics professor posed when I was in college. I picked it up in a thrift shop after it caught my eye. I was a Navy electrician’s mate ’86 – ’88 abord a frigate. I qualified to operate the electrical generating plant after the six other applicants failed the oral boards. I was the only one who didn’t go to any A schools, so knew I didn’t know anything and, therefore, actually studied for it. I was stationed at Miramar, and I was trying to get all of the NEETS manuals. For some reason they ran out and I could not complete the set. I still have everything I was able to get. I worked ARN 52’s for those who know what I am talking about. I think I could start right up again on that gear, it was etched into my head for life LOL. I would like to get the rest of the series. Regardless of what some might say, that was the best training you can get still.